Katie Armiger pretty much introduced the crowd to modern country music in the Liverpool Arts Club’s loft on this cold November night. She introduced us with all the southern hospitality that is expected as seen from a myriad of filmic references, (See: Frank Underwood in House of Cards), and the audience immediately felt right at home. Opening for Armiger were the lovely Holly May and Madeline Smith. Holly May’s voice was heard all the way from downstairs and she was warming the stage up strongly. She finished with much applause from the audience, and it was time for Madeline Smith. She opened with a few of her own tracks, mixed in with a cover of Adele’s ‘Rolling in the Deep’: a challenge for any singer. Smith’s vocal is lighter than Adele’s but the range is just as wide. She smashes the song with seemingly little exertion. The vocal gymnastics of ‘Rolling in the Deep’ are to her what sitting on the couch watching Netflix is to me: like water off a duck’s back. Smith’s relaxed style and effortlessly strong vocal twinned with her unassuming demeanour make for a pleasing listener experience. Songs like ‘Bigger than me’ and ‘Catching Fireflies’ are nostalgic, everyday and accessible. Maybe I’m a rookie but she sang like an empowered cowgirl: she didn’t miss a note and she went for it, full pelt, for her entire set. After Smith left, Armiger graced the stage. Smith’s sound was enjoyable; she was everything I had expected in a confident female country singer. Katie Armiger on the other hand completely disarmed the audience. Isn’t country music all acoustic guitars, lost love and pick-up trucks? When Armiger rocked up to the stage, accompanied by a full 4-piece band with drums, bass and electric guitar, it was obvious that this wasn’t the case. Usually, the appearance of any act shouldn’t matter, but it’s important to stress here that Katie Armiger did not look like a country singer. Armed with a spiky silver wrist cuff, black leather pants and a shock of dark Berry-red hair she was a formidable powerhouse unlike the Daisy Duke stereotype. Her first song rolls seamlessly into a mash-up cover of Michael Jackson’s ‘Billie Jean’ (surely a homage to Civil Wars), as well as the whole set incorporating a host of covers including: The Beatles’ ‘Get Back’; The Rolling Stones’ ‘Gimme Shelter’; Adele’s ‘Turning Tables’; and, most toe-tappingly, Shania Twain’s ‘Man, I Feel Like a Woman’. Armiger tells the audience that this is a favourite song of hers, as though you couldn’t glean that information from her dancing and the gleaming smile on her face throughout. These covers cleverly open up the genre to an audience who might otherwise not be country music aficionados. After all Liverpool City Centre – home of mod pop – isn’t exactly known for its countrified roots. This is the last night of Armiger’s UK tour and you can tell how bittersweet it feels for her, the band and her supports. They got a group selfie (or grelfie) before their set, and she later introduces every member of her band individually to the room: a classy move which is sometimes overlooked. The crowd is a little thin but Armiger’s seamless vocal, along with her tight band, make for an upbeat atmosphere. The song ‘Scream’, which Armiger introduces with the precursor that this is for “anybody who has ever had one of those days where everything becomes too much and you just have to let it out”, is a much deeper, emotive track than anyone would have expected from the sassy southern songbird. Songs like ‘Kiss Me Now’ and ‘One Night Between Friends’ are raving examples of her strong message of female empowerment, intentionally or not. She definitely broke down any of my preconceptions (or misconceptions) of country music. 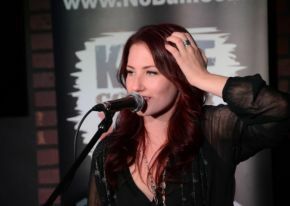 In short: Katie Armiger is a warrior rocking an outstanding set of country pipes.